Choosing a school is no easy feat. Before you invest in your bachelor’s degree, find South Dakota’s best colleges by alumni salary. 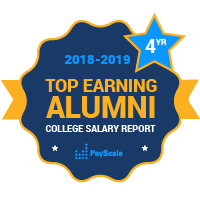 Among the top colleges in South Dakota for median career salaries is South Dakota School of Mines & Technology as graduates from here earn the highest both in their early career with a median salary. While graduates from Northern State University might make less than graduates from other South Dakota colleges, they aren’t necessarily unhappy about it. In fact, they are most likely to be satisfied with their careers with many reporting that their jobs are meaningful. Many graduates from South Dakota’s colleges go on to work in careers in the Bioscience; Financial Services; Professional Business Services; Oil & Gas; Shooting, Hunting & Outdoors; and Value-Added Agriculture industries. Popular employers for South Dakota graduates include IBP Hog Market Inc; Ellsworth Air Force Base; Rapid City Regional Hospital; Sanford Univ South Dakota Medical Center; John Morrell Food Group; Regional Health Physicians Inc; VA Medical Center-Fort Meade; Avera St Luke’s Hospital; and Larson Manufacturing Co.